During most of the World War II Battle of Iwo Jima, Marine Pfc. Silas Jessup was a stretcher bearer. He received a commendation from the commanding general of his division for carrying more than 100 dead and wounded U.S. Marines and a Japanese Imperial Marine off the most costly battlefield foot-for-foot in the Corps 231-year history. Jessup arrived on Iwo a couple of days after the American flag went up atop Mount Suribachi, four days into the 36-day battle that began Feb. 19, 1945. There was still a month of the deadliest fighting Marines have ever taken part in to capture the 8-square-mile volcanic island. The 18-year-old stretcher bearer was in the thick of it. Jessup was a member of Fox Company, 2nd Battalion, 9th Marine Regiment, 3rd Marine Division. The division’s primary objective on Iwo was to capture the air fields in the center of the island. “Our company was lead by Capt. Louis B. Wilson, who received the Medal of Honor for his actions on Guam. He was commanded by Lt. Col. Robert E. Cushman, who got the Navy Cross on Guam, the second-highest medal for bravery. They both became Marine Corps Commandants,” the 81-year-old Burnt Store Meadows resident said. Jessup and a group of fellow Marines were replacement Leathernecks during the Guam battle. This battle is where Allied forces stopped the westward advance of the Japanese for the first time in the Second World War after weeks of hard fighting on the 30-mile long island. He was supposed to be an ammo bearer for a .30-caliber light-machine-gun unit. But when they found out he could type, they turned him into a clerk typist and sent him to headquarters company to pound keys. A few months later his battalion reached Iwo Jima aboard the attack transport USS Randall. He remembers seeing the first American flag go up on Suribachi the morning of Feb. 23, 1945, as he waited to go ashore. He and everyone around him were celebrating after seeing “Old Glory” raised atop the little hill on the south end of the island. “By the time we were ashore awhile, everyone I landed with had been killed or wounded. I volunteered to work as a stretcher bearer to get the wounded out,” Jessup said. “I went with a Navy corpsman to rescue the dead and wounded. The corpsmen put their lives in danger over and over under terrible conditions. Sometimes it would just be Jessup and a corpsman who went searching for dead and wounded. On those occasions he would have to hoist the dead and the dying onto his back. On other occasions there might be a corpsman, Jessup and another Marine with their canvas stretcher. “One time when we had a stretcher I picked up a guy’s leg. The Marine had his leg severed by an artillery round. The corpsman put a tourniquet on the stump to stop the bleeding. “There was so much stress (because they were also under enemy fire much of the time). The Marine on the stretcher passed out from loss of blood. I just threw his severed leg on the stretcher, too. At one point, during an enemy artillery barrage, Jessup was down in his foxhole trying to dig it deeper with his bare hands as the shells came closer and closer to the hole he and a buddy were in. If an enemy artillery round had landed in their hole it would have exploded and caught fire. They would have been burned to a crisp. While his battalion was capturing the southernmost air strip on Iwo Jima, Jessup and a corpsman were out looking for wounded and dead. They came across a Japanese Imperial Marine who had been shot six times, but was still breathing. “One of our Marines said, ‘We should put a bullet through his head.’ But the corpsman I was accompanying said, ‘No. We’ll take him back and try and save him. I don’t think the enemy Marine was unconscious at the time. Jessup never saw the enemy Marine again, but he believes he may have survived. The reason Iwo Jima was important enough for 6,800 American Marines to get killed and 17.400 more wounded taking it is because of its two air strips. When Marines captured the island on March 26 it gave the American B-29 bomber crews an emergency landing strip 700 miles closer than Saipan where they were flying from on their daily bombing raids over Japan. These two runways built by the Japanese and lengthened by the Americans saved the lives of more than 20,000 American airmen before the war ended fewer than six months later. By the time the shooting stopped on Iwo Jima, Pfc. Silas Jessup had carried more than 100 dead, dying and wounded Marines to safety. Sometimes he and the corpsmen were were pinned down for hours under withering enemy fire; other times it wasn’t too bad. He survived his 30-day ordeal in the hellhole called Iwo Jima without so much as a scratch. That in itself was a bit of a miracle. For Meritorious Service while serving on Iwo Jima Volcanic Island from 20 Feb. 1945 to 5 April 1945. Pfc. Silas Jessup landed with headquarters company as a battalion clerk. He voluntarily worked day and night organizing and leading stretcher parties to the front lines under intense artillery, mortar and small arms fire. On several occasions he was pinned down by small arms fire for two or three hours at a time. During the latter part of the campaign, Pfc. Jessup supervised the collecting and removing of the dead from the area which were not completely cleared of snipers. Through his efforts the evacuation of the wounded and the dead was greatly expedited. The information concerning the casualties was of great benefit in keeping the records up to date. His untiring willingness to do anything that would help was an inspiration to those associated with him. His actions were in keeping with the highest traditions of the United States Naval Service. This story was first published in the Charlotte Sun newspaper, Port Charlotte, Fla. on Sunday, March 11, 2007 and is republished with permission. Click here to view the collections in alphabetical order in the Library of Congress. Jessup was interviewed before Don started working with the Veterans History Project. of Camby, passed away Thursday, January 19, 2017 at age 90. He was born April 29, 1926 in Mount Vernon, Ohio to Audrey Anne and William Jenning Bryan Jessup. He was preceded in death by his parents; sisters, Annabelle and Olga; and wife of 52 years, Joann Zabarsky Jessup. He is survived by his sons, Daniel (Bob Chenoweth) Jessup, Nathan Jessup, Michael (Anne) Jessup, and Thomas Jessup; grandchildren, Zachary, David, Stephen, Ryan, Jennifer, Lauren and Sarah Jessup, Nicole Moore, Courtney Kolb, Adam McGill, and Joey Wichman; and many great-grandchildren, nieces, nephews, cousins, in-laws, and friends. Mr. Jessup was a U.S. Marine Corporal, a veteran of World War II, who served in harm’s way at the Battle of Iwo Jima. He received wartime commendations for meritorious service, and shortly before his passing was bestowed an honorary tribute by the Veterans Administration. He retired from RCA Corporation, having traveled the world and lived for a time in Taiwan. He and Joann spent the majority of their retirement years in Punta Gorda, Florida, but returned to Indiana in 2012 to be near family. Mr. Jessup enjoyed cycling, canoeing, nature, photography, music and electronics. 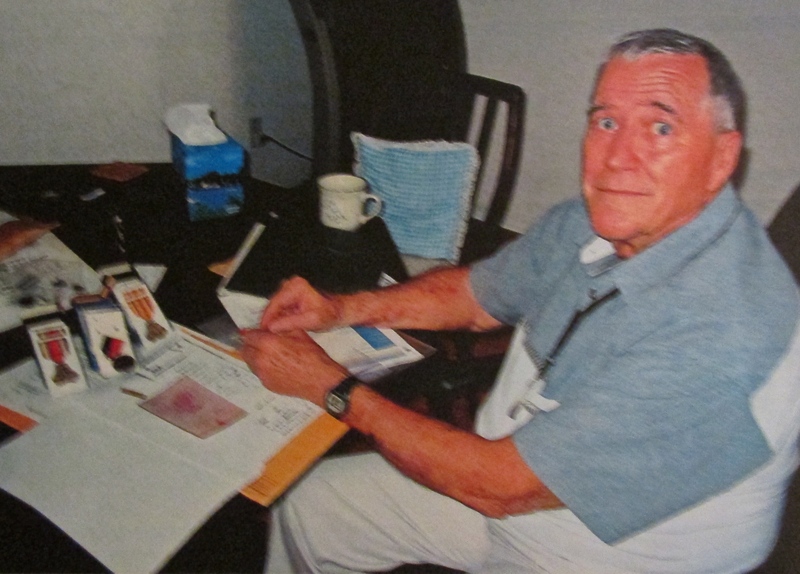 He volunteered for the Charlotte Harbor Environmental Center, Inc. in Punta Gorda for many years. A celebration of his life will be held Sunday, February 12, 2017 at 2:30PM at Beth Israel – The West Temple, 14308 Triskett Road Cleveland, Ohio 44111. Most members of Mr. Jessup’s extended family reside in Cleveland. Arrangements entrusted to A.R.N. Funeral & Cremation Services. Friends may leave a memory or message of condolence by visiting the online obituary at www.arnmortuary.com. Good reporting. Its vital these vets get their remembrances recorded. You’re right – At the rate we’re losing these WWII vets it’ll soon be too late to get any WWII story. Thank you for reading War Tales.